One of the things that drives me is working together to solve problems that affect us all. In the wealthiest country in the world, we shouldn’t have homelessness. Yet this year 2.5 million children will experience homelessness. 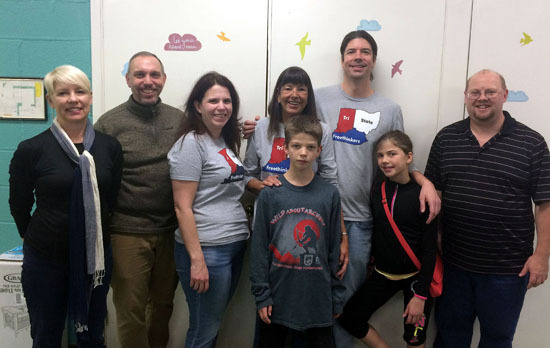 Recently, a group I’m involved with, The Tri-State Freethinkers(TSF) connected with the Interfaith Hospitality Network (IHN) of Cincinnati (known nationally as Family Promise) to help host homeless families. Family Promise is a national organization that works to help people gain “sustainable independence” including permanent housing. 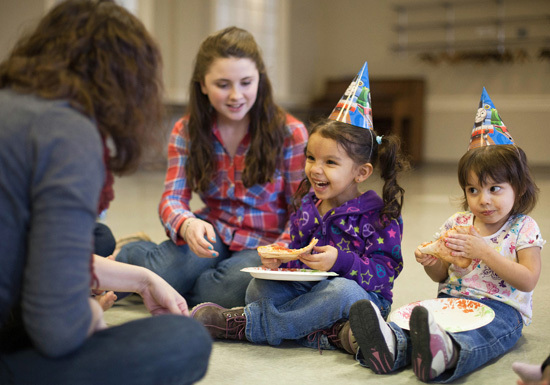 Various congregations in Cincinnati host families overnight with help from local volunteers who help prepare food and entertain. TSF hosted a group overnight at Pleasant Ridge Presbyterian Church. Family Promise volunteers strive to make parents and children feel at home. What’s involved with hosting families? Cooking dinner. Playing games with the kids after dinner. Helping folks with anything they need at the church. We cooked spaghetti and salad and garlic bread and homemade croutons and brought games for entertaining after dinner. Pleasant Ridge Presbyterian set up sleeping quarters for everyone and one couple stayed with folks overnight in case they needed anything. Hosting has been done at churches, synagogues, mosques, temples, schools, hospitals, and other community spaces. The idea is to use available community resources to solve temporary housing needs (while working with families and the community to find sustainable housing). Delivering food in the basement at Pleasant Ridge Presbyterian church. We hosted four families (four women and eight kids). One of the things that surprised me was learning how many families and kids are without homes. It’s absolutely heart-breaking. So as not to stigmatize any of our guests, I won’t print any names or show any pictures of the folks we hosted. I think it’s one of the best interfaith initiatives I’ve seen. Our contact here in Cincinnati put me in touch with Claas Ehlers, president of Family Promise, because I wanted to know how it got started and how they involved so many people. Claas explained that one of the things they try to do is raise awareness of homelessness (what it is and what it isn’t). The simple fact is that there is a lack of affordable housing in this country, especially for low-income families. There is no state in the US where a full-time minimum wage worker can afford a one or two-bedroom apartment at fair market price. Many of those served by Family Promise are working families who cannot afford housing. And often, families that are housed but living paycheck to paycheck become homeless due to one catastrophic setback: an injury on the job, a child’s illness, a divorce, even a cut in hours. In many cases, it’s easier for people to give up their housing than it is to give up their car. Because you can’t give up your car. If you give up your car, you can’t get to a job, you can’t get to the grocery store. One of the problems though is that once you get into a hole like this, it’s really hard to get out. If you’ve been to a McDonalds or been to a Walmart you’ve likely seen families who are homeless and not even known it. The homeless are still families. They’re just families without a permanent place to live. The lack of permanent stability, however, has a devastating effect on the kids. When you can only focus on getting through the current day, it’s virtually impossible to teach kids any of the skills they need to survive (much less advance) in society. Family Promise was started in New Jersey by Karen Olson after she bought lunch for a homeless woman. 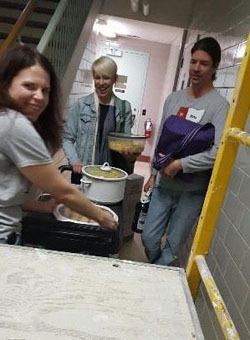 After listening to the woman’s story, she started to understand how disconnected she was from society and as a result, she started delivering lunches to the homeless. Then, she reached out to the religious community and started bringing the homeless together with people who wanted to help. She realized existing community resources could provide shelter and meals. This was how the first interfaith hospitality network opened in 1986. What this also does is help turn people into advocates for low income families. You start thinking about things that so often we take for granted like, is public transportation available? Does the bus run after 8 PM at night? Who else do I know that might be able to provide some help? Dentists? Job training? Childcare? In addition, many of the volunteers are children themselves. The program helps expose kids of volunteers to helping others and to kids who are a lot like them, just without a home. Since the program’s start, Claas explained, they’ve helped over 650,000 people (53,000 just last year). 60 percent of the people they’ve helped have been kids. When kids are in crisis, we need to act as a community. Family Promise is a great example of bringing people together for a common cause. I love that they have so many diverse groups helping. Claas explained that the program started with 10 churches and a synagogue and now engages 170,000 volunteers and more than 6,000 congregations across 42 states. This includes a Mosque in Las Vegas and a Buddhist temple in Hawaii. We hope to continue to help as an atheist group. What we’ve found is that we all tend to share far more in common in terms of values than we have differences. All of us seem to believe, for example, that we have a duty to help those in need. We’d like to thank Claas and Karen and Georgine and Pleasant Ridge Presbyterian Church and everyone else involved in Family Promise for running such a wonderful program that brings people together to find sustainable housing for the homeless. If you’re interested in volunteering, you can contact a local affiliate in your area. If you don’t have an affiliate in your area, you can contact Family Promise for information about starting one. If you just want to donate or find out more information about the organization including some of their other programs (family mentoring, education about homelessness, helping homeless families keep pets), please visit their website.